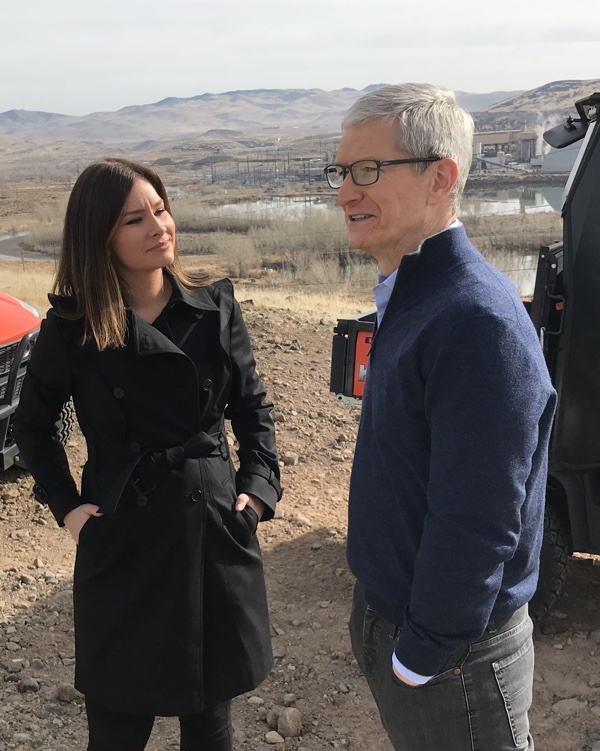 While visiting the Apple data center located in Reno, Nevada this afternoon, Apple CEO Tim Cook did a quick interview with Rebecca Jarvis of ABC News, where he discussed Apple's economic announcements and touched on the ongoing controversy over power management features in older iPhones. According to Cook, when the power management features were first introduced in iOS 10.2.1, Apple did explain what was going on, but following the controversy, he believes Apple should have been clearer. The company did indeed mention that the shutdown issue was caused by uneven power delivery and explained that its power management system had been tweaked, but there was no clear notice that it could cause devices to operate more slowly at times. Cook says Apple "deeply apologizes" to customers who thought the company had other motivations. About a year ago, we released some code that essentially what it does... is all batteries age over time and they become unhealthy at a point in time and an unhealthy battery has a probability that it will create an unexpected restart. And so you can imagine if you're making an emergency call or you're making an important call that's important to you or a message that you're waiting for, or you want to capture that moment that's fleeting with your camera... we always focus on the user experience. So at the heart of any decision that we make is the user. We felt it would be better to take something off of the performance to prevent that from happening. When we did put it out, we did say what it was, but I don't think a lot of people were paying attention and maybe we should have been clearer as well. And so we deeply apologize for anybody that thinks we had some other kind of motivation. Our motivation is always the user. The user is at the center of everything that we do. Apple previously apologized for the misunderstanding over the iOS 10.2.1 update and has since implemented a battery replacement program that allows all customers with an iPhone 6, 6s, 7, 6 Plus, 6s Plus, 7 Plus, and SE to replace their batteries for a reduced $29 fee through the end of 2018. Apple is introducing better battery monitoring features in a future iOS update, and Cook says Apple will also allow customers to turn off the power management feature, which is new information that the company has not previously shared. We're also going to... first in a developer release that happens next month, we're going to give people the visibility of the health of their battery. So it's very, very transparent. This hasn't been done before, but we've thought through this whole thing and learned everything we can learn from it. So we want to do that, and in the situation... and we will tell someone we're reducing your performance by some amount in order to not have an unexpected restart. And if you don't want it, you can turn it off. Now we don't recommend it, because we think people's iPhones are really important to them, and you never can tell when something is so urgent. Our actions were all in service of the user. I can't stress that enough. Much of the rest of Cook's interview focused on the announcements that Apple made today. The company plans to repatriate a large portion of its $250 billion in overseas cash thanks to a change in U.S. tax policy, which will result in Apple paying $38 billion in taxes. With the tax bill, investments, the creation of a new campus, and more, Apple believes it will directly contribute $350 billion to the U.S. economy over the next five years, along with 20,000 new jobs. When asked about whether Apple would have been able to make these announcements without the tax policy changes, Cook said there are "large parts" of the announcement that are "the result of the tax reform" and "large parts" that Apple "would have done in any situation." He went on to explain that the corporate part of the recent tax bill has the potential to bring a faster growing economy. There are two parts of the tax bill. There's a corporate piece and an individual piece. I do believe the corporate side will result in job creation and a faster growing economy. When asked about whether Apple would introduce a cheaper iPhone due to the new policies, Cook said it was unlikely, telling interviewer Jarvis that "the phone costs what the innovation inside of it costs." The final bit of the interview touched on where Apple might open its new campus, which was announced by the company earlier today. Cook said details will be shared later in the year, but it won't be located in Texas or California, where Apple already has campuses in Austin and Cupertino, respectively. "When we did put it out, we did say what it was, but I don't think a lot of people were paying attention and maybe we should have been clearer as well." We're not mind readers. When Apple says "improves power management during peak workloads" nobody but Apple engineers translates that to "we throttle your processor frequency." Phone can crash. Or phone can keep running. I'm still mystified that people got all bent out of shape that the phone does what it needs to do to keep running. My son's phone was experiencing this (the phone crashing when it had 20-25% battery), until he upgraded to iOS 11, then the crashes stopped. Seems to me if your option is a crashing phone, or one that keeps running, most people would opt for the latter. People must really be looking for things to turn into causes. Apple got caught slowing down old iPhones on purpose - whether it was to drive additional upgrades or to compensate for weak batteries - their motivation doesn't really matter. They got caught, and they're about to pay a heavy price for it. Today's PR push is aimed at mitigating the damage. Amazing to see still so many people saying Apple did nothing wrong. The level of their “loyalty” is beyond imagination. An unhealthy battery IS covered under warranty. Apple will gladly replace it if it fails a hardware test. What they won’t do is give you a free battery 3 years after you purchased the phone. The throttling starts well before the battery is considered unhealthy by Apple. It sounds like a design flaw from an engineering level. The batteries used were probably either too small for the draw, or maybe they were defective. Yes, batteries don't last forever, but having so many fail to the point that Apple has "fix" the issue by gimping the phone is a problem. apple never said they were deliberately throttling phones when 10.2.1 was released, they only said, and i quote, that the update "also improves power management during peak workloads to avoid unexpected shutdowns on iphone"